This week in the war, Australian Prime Minister Robert Menzies was touring the British Isles. He was in Plymouth on 21 March 1941, and witnessed a heavy air raid, with the Luftwaffe dropping 20,000 incendiary bombs across the city. Twelve large raids were launched against Britain during March. Most were against ports, as well as London. Bristol had been badly hit when Churchill and his staff arrived the morning after the raid. Included in the group were Robert Menzies and the newly appointed United States ambassador, John Winant. 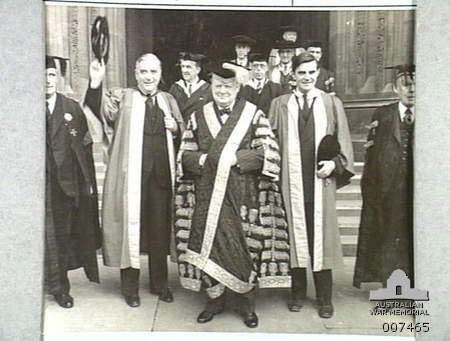 Both received honorary doctorates from the University of Bristol, where Churchill held the post of chancellor. Churchill had been fortunate with Roosevelt’s most recent emissaries. Republican Wendell Willkie, who had lost against FDR in the race for the presidency, had toured bomb-ravaged Britain in January and reported back on the bravery and steadfastness of the British people. He swayed more than a few of his country’s politicians to vote in favour of Lend-Lease. Then Ambassador Winant had arrived at the beginning of March and immediately won the British over—being a marked contrast to his predecessor, Joe Kennedy, who had been convinced that Britain could not hold out and that it would be futile for the USA to send further supplies of arms. [More details, including accounts of the bombings, are given by Juliet Gardiner in her book The Blitz: The British Under Attack (Harper Press, 2010)]. As for the Australian Prime Minister: Mr. Menzies continued his tour of the UK. 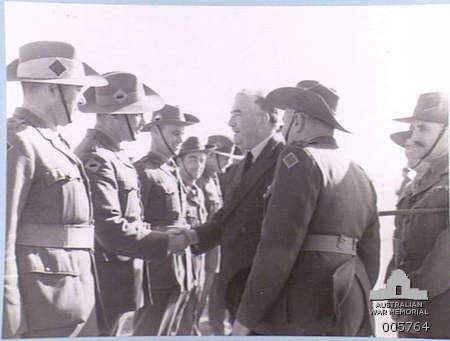 Afterwards, he went on a tour of inspection of Australian troops that were stationed in the Middle East. This entry was posted in Book, World War II and tagged Australia, Blitz, Churchill, John Winant, Lend-Lease, Robert Menzies, Roosevelt, Wendell Willkie. Bookmark the permalink.